In honor of Valentine’s Day this month, let’s talk about the link between your teeth and your heart. Heart disease is a very prevalent and very serious condition. You may be familiar with ways to ward off heart disease, such as more exercise and less salty/fatty foods. But did you know that you are also protecting your heart when you brush your teeth every day? 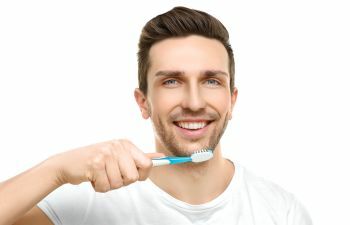 Countless studies have shown that routine brushing is not only vital to your oral health, but it can play a strong role in the prevention of cardiovascular disease. Your heart demands a constant supply of oxygen and nutrients through your blood. If one of the branching coronary arteries that delivers this oxygenated blood becomes blocked, a portion of the heart is deprived and starved of oxygen. This is referred to as cardiac ischemia. If cardiac ischemia lasts long enough, the starved heart tissue can die – which is more commonly known as a heart attack. Where does tooth brushing come in? We know that proper oral hygiene (brushing your teeth) can keep the gums in good condition. When the gums are diseased or infected, the bacteria can travel through your bloodstream and impact your heart. In other words, the inflammation found in your mouth can also be present in the heart. This is why the American Academy of Periodontology reports that people with periodontal disease are almost twice as likely to have coronary artery disease. Another study found that the common oral problems, such as gum disease (gingivitis), cavities and missing teeth, were also good at predicting heart disease. So, the next time you feel tempted to skip brushing your teeth, consider the ramifications it may have on your smile as well as your heart! At Pure Dental Health, we value the importance of teaching patients the strong link between oral health and body health. To schedule your dental visit, please call our Buckhead or Dunwoody office.